The wait is over... Dragon claws are now available in tournament world! With two weeks before tournament worlds are removed, get in while you can and enjoy slicing and dicing some noobs! Tournament worlds just got a little more intense. Dragon claws are now available in supply chests! The special attack of the dragon claws, slice and dice, hits 4 times in quick succession with great accuracy. This special attack makes claws a fantastic K.O. weapon and one which is well worth the trip to a tournament world to try out! Dragon claws will be present in tournament worlds until the worlds are removed at the start of March. Get in while you can and have some fun with this iconic RuneScape weapon! A familiar face is having a bit of trouble with a misplaced item and is in need of your help. 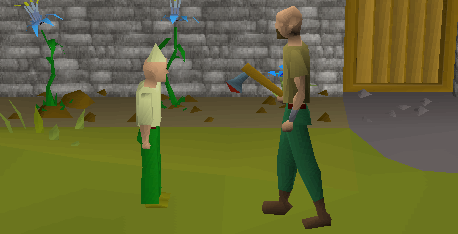 Head to Lumbridge castle and talk to gnome child in order to get started with this year's birthday event! For completing this event you will receive the rewards from the past two birthday events (the warship and cow suit) as well as a brand new reward: gnome child's hat! The lever which teleports you into the lair of the King Black Dragon has a new option to open up a private instance of the lair. Opening an instance costs 50,000 coins. You must have coins in your inventory in order to pay this fee. Once you leave the instance, or log out within it, it will close and you will be required to pay another 50,000 coins if you would like to create another. Please note: Items dropped or abandoned inside an instanced lair will be permanently lost. Various kinds of Agility course ropes and ropeswings have had their clickzones made larger. A link to the Old School world map can now be found on the homepage of the Old School website. The giant mole will no longer dig and flee if it is on 10hp or below. Slayer masters now give you information about your current task if you prematurely request a new one. The nests you receive when trading mole claws and skins to Wyson the gardener now provide you with more valuable seeds. Hard clue scrolls are now dropped by black demons. Hammers are now dropped by goblins. The Solus Dellagar cutscenes in the Wanted Quest now work more consistently, and give more information to the player. The poly limit has been increased. The elite diary tasks to lay 5 or 6 box traps have been removed. The Nightmare Zone versions of Fareed and Flambeed will no longer have a chance of dropping your weapon to the ground if you have a full inventory. The distance Vet'ion's hellhounds can move from their spawn point has been increased substantially. The quick spellbook swap option for the Arceuus spellbook is now labelled as 'Arceuus' rather than 'Necromancy'. Random events will no longer trigger when in the Abyssal Sire or Cerberus chambers. The object 'Goldsmith gauntlet' has been corrected to 'Goldsmith gauntlets' to match the cooking and chaos versions. The Rimmington general store door will now remain open permanently. The most southern Abyssal Demons in the Slayer Tower have been moved north marginally to prevent them from leaving their room. The double HP restore rate feature of the HP skillcape (and Max cape) now works again. The Ring of Wealth (i) now doubles the rate of receiving clue bottles from fishing in the wilderness. Some of the decor in the Lizardman Shaman area has been changed to allow the player, and therefore NPCs too, to walk over it. This should reduce safe-spotting. Nice yayyy finally. Zeaaaaah updatteee w000t. We can do any faction now? That's not come out yet. Mat's come up with a nice design for how to unlock it, and the artists are doing the GFX side of it while Maz does the code. I believe they're making good progress. I hope we can help you get unbated in the next week or two.